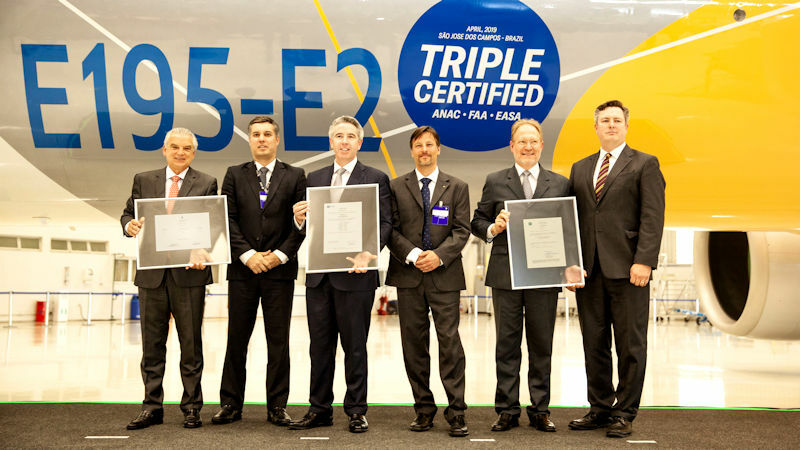 The triple certification, from the Brazilian Civil Aviation Agency ANAC, the US FAA and the European Aviation Safety Agency EASA, paves the way for an entry into service later this year. Embraer has given no date yet for first delivery. The E195-E2 is the biggest of the three members of the E2 E-Jet family, seating up to 146 in a single class configuration, or 120 in a two class layout. The smaller 104 seat E190-E2 is already in service, with first delivery to Norway's Widerøe in April 2018. The baby of the family, the 80 seat E175-E2, is due for first delivery in 2021. The E195-E2 will enter service with Brazilian airline Azul in the second half of the year. Azul has 51 of the type on order.